Akzo Nobel has acquired two businesses in the UK to enhance its network of Dulux Decorator Centres and further improve the service and support offered to its trade customers. The deals involve the purchase of Whites Trade Paints, based in South East London, and Cambrian Decorators Supplies (C.D.S.) Limited, which trades as The Colour Centre. The latter operates from eight stores in Newport, Swansea, Cardiff, Bristol, Bracknell, Swindon, Gloucester and Birmingham. “These excellent additions to the Dulux Decorator Centre network will enable us to further develop our business in South East London, South Wales, the West Country and the Midlands,” explained Alistair McAuley, the recently appointed managing director of AkzoNobel’s Decorative Paints business in the UK and Ireland. 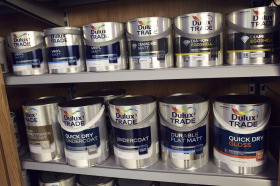 Both businesses will continue under their current trading format, operating under the leadership of John Henderson, Dulux Decorator Centre managing director. We advised them to do this years ago - better late than never!